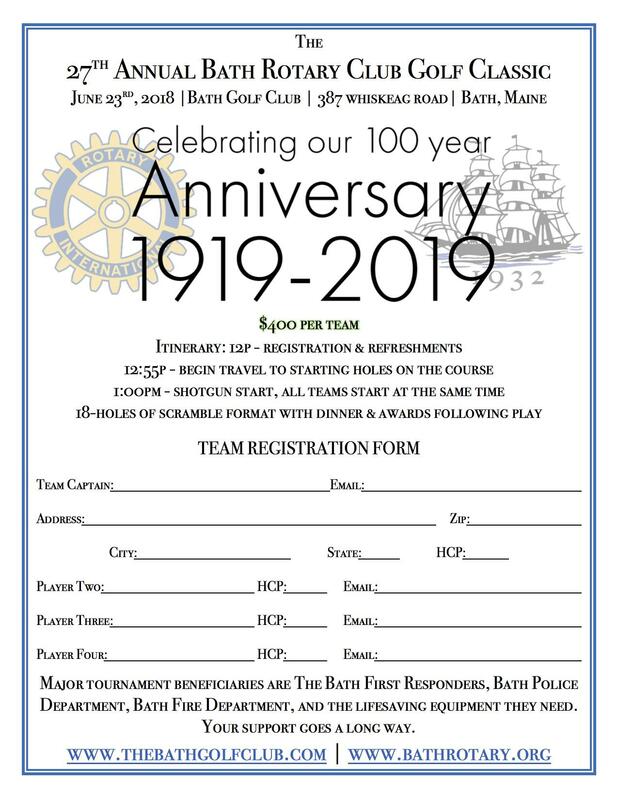 Save the date: Saturday, June 23, 1 pm at Bath Golf Club for the 27th Annual Bath Rotary Golf Tournament. 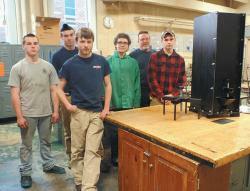 This year the proceeds will benefit Bath's First Responders to purchase life saving equipment. 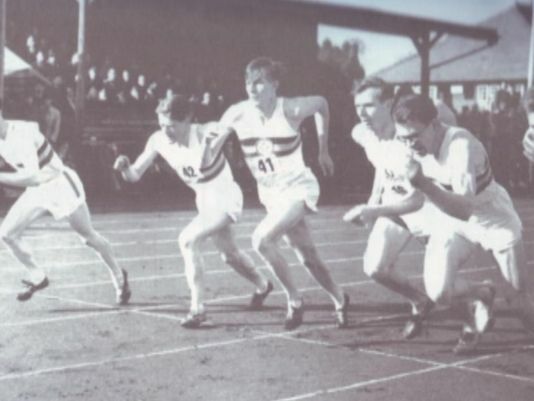 Download a team registration form from the downloads area on the left side of our home page. Thank you to all who generously donated their time, groceries and money to help the Bath Area Food Bank. We collected 820 pounds of food and $778 in donations. 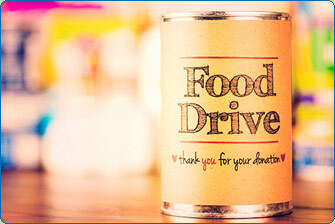 Your help makes a big impact to the Food Bank and those they serve. Save the date: Wednesday, June 21 to Skip Work & Play Golf for a great cause. The 26th annual Rotary Golf Tournament will be held at the Bath Golf Club. Registration fee includes 18 holes of golf (scramble format), cart, continental breakfast, and buffet lunch. Download a registration form by clicking here. Bath Savings Institution, First Federal Savings, JHR Development and Springer's Jewelers. 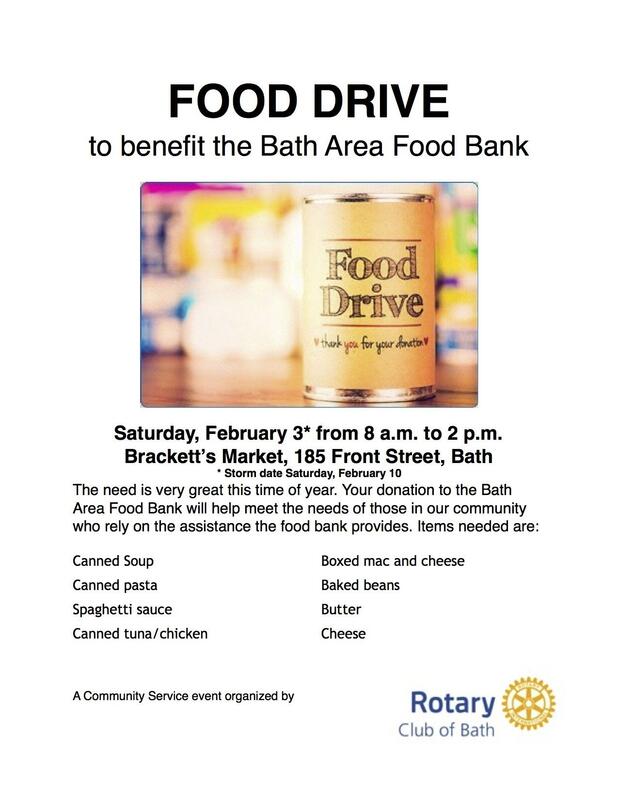 The Bath Rotary Club, in conjunction with the Bath Sunrise Rotary and the Morse Interact Club, will be holding a Food Drive to benefit the Bath Area Food Bank on Saturday, February 4 at Shaw's Supermarket in Bath from 8 a.m.- 2 p.m. We will be accepting food and cash/check donations for the Food Bank which is especially in need of donations this time of year. We will be handing out shopping lists of needed items that include butter and cheese. In the event of a snowstorm, the drive will be held on Saturday, February 11. Vice President Bob Warren awarded a very deserving Brian Hatch a Paul Harris Fellow award at the December 6, 2016 meeting of the Bath Rotary Club. 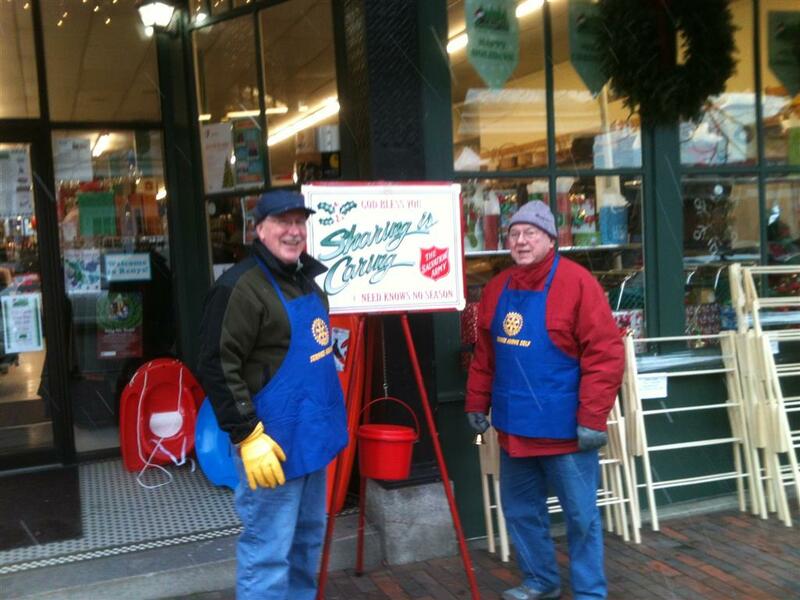 Brian, who has contributed to the Bath community through his career in Education and Athletics in local schools, and his service to Main Street Bath as a volunteer and Past President plus his service to the Maine Principals Association and Kennebec Valley Athletic Conference as well as to the Morse Alumni Association, plus many other efforts and accomplishments. Brian's infectious enthusiasm and energy is inspiring and kudos to Bob for recognizing Brian for his efforts. The 3rd annual 4-way 5K run/walk had 107 runners who enjoyed a beautiful autumn morning and participated in a fun event. Thank you to the presenting sponsor Mid Coast Medical Group - Bath and to the Bath Rotarians and volunteers from LifeChurch for creating a successful event. Electronic Waste Collection October 22, 8 a.m.-noon at Morse H.S. District Governor put out the call to Club Presidents to honor new (2 years or less) members who have made a contribution to their clubs. I was pleased to award 3 of our club members with the Above & Beyond award for their efforts both to the club, the community and internationally. Rich Cromwell was present at the dinner and was recognized for his work in Cambodia at the CIO Orphanage and also for his efforts to get water filters to the outlying villages of Siem Reap. Sawyer Boulette started our first "4-Way 5K" in 2014. It was a complete success and was even more so in 2015. This is becoming a highlight event during AutumnFest in Bath on Columbus Weekend that is a lot of fun to help with and participate in. Runners get awesome long sleeve tee shirts and a chance at winning cash prizes. We're looking at putting on our 3rd annual 4-Way 5K this October! Liz Wyman took over the Annual Golf Tournament last year from a long time tournament manager and did a great job with the sponsors and organizing the event. With a graduating senior at home and navigating big changes at the bank where she works, she managed to pull off a very successful tournament. 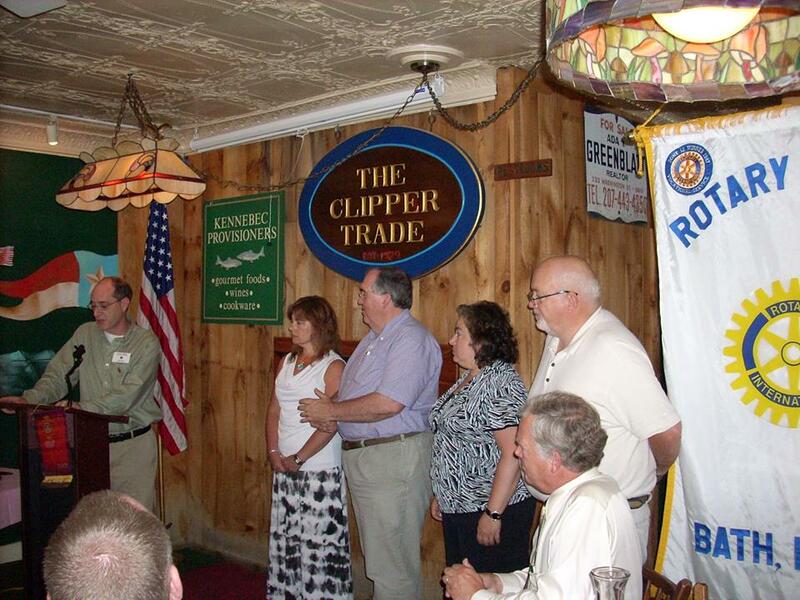 Thanks to these new members who have gone Above and Beyond to help the Bath Rotary Club succeed in reaching its goals to improve our community both locally and globally. 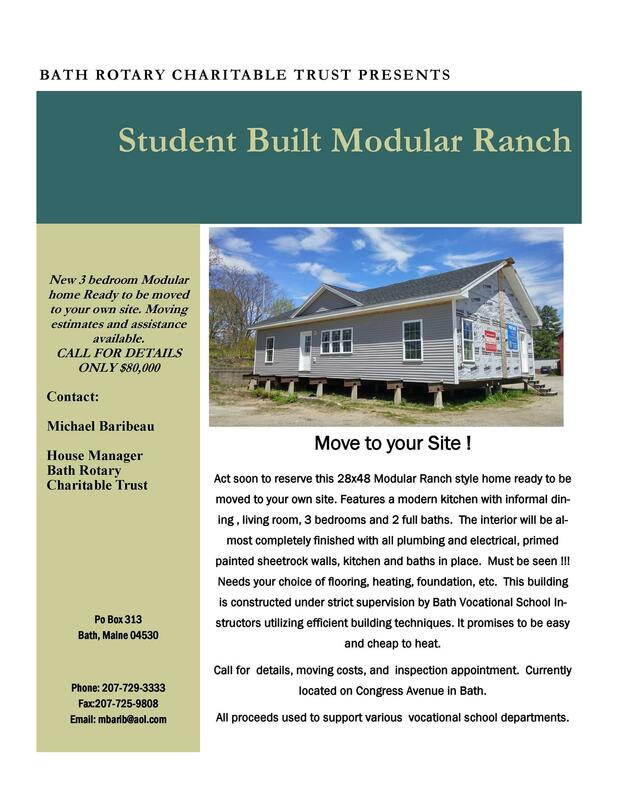 The Vocational School Modular House project is moving along. The Electrical team is putting the final finish to the lighting and the For Sale sign went up. 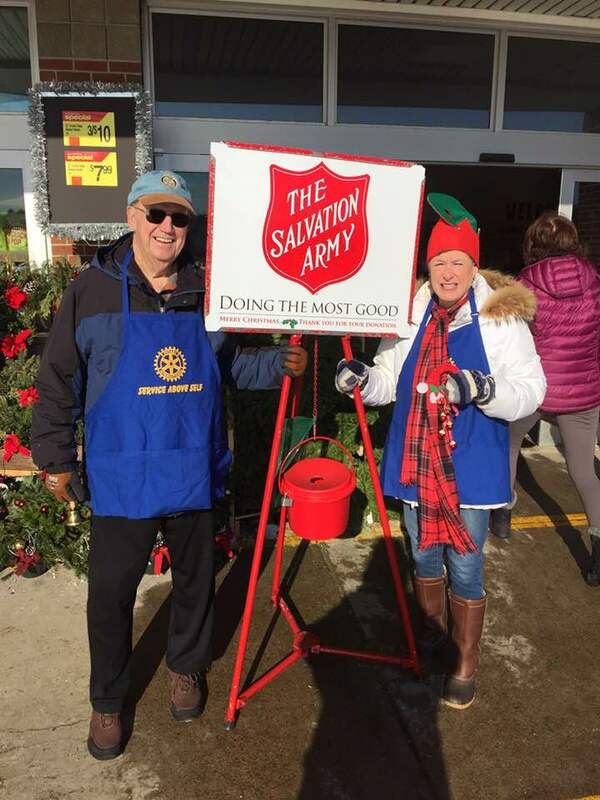 In just 6 hours we and our fellow Sunrise Rotarians helped raise just over $1000 in cash and check donations, plus collected almost a busload of food for the Bath Area Food Bank. Bob Warren chillin' in shorts, with Liz Wyman and Tom Edwards. Members of the Morse High Chorus entertained the club after a fabulous lunch prepared by the Culinary Arts students at the Bath Regional Career and Technical Center. Here is the first post from Rich on his progress in working with the CIO Orphanage in Cambodia. Free E-Waste Collection Oct. 24, 8 a.m.-noon at Morse H.S. 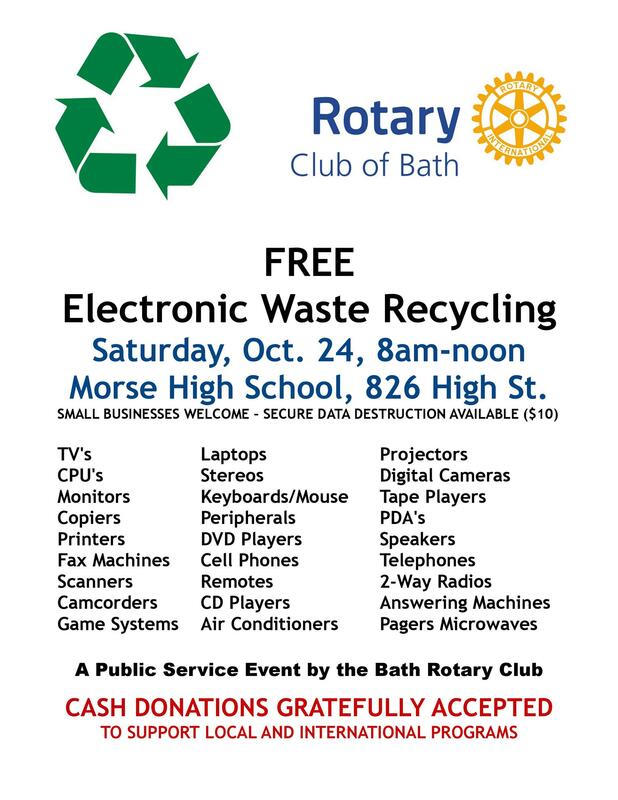 Free Electronic waste collection will be held at Morse High School, 826 High Street, Bath on Saturday, Oct. 24 from 8 a.m. to noon. Anything with a cord and board will be accepted. Individuals and businesses are welcome to drop off their outdated, broken, unused and unwanted electronic equipment and devices. Secure data destruction is available for $10. Cash donations welcome. 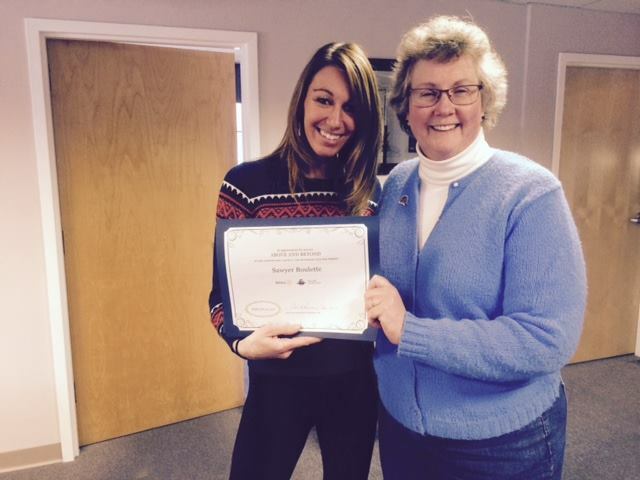 See more information at www.bathrotary.org or by calling 207-415-3877. 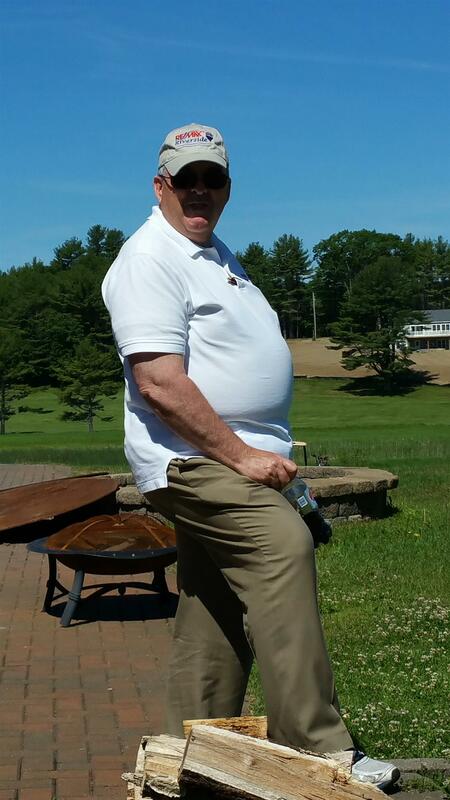 24th Annual Rotary Golf Classic held on June 17th - a great success! Great job everyone on this year's tournament! The weather, the course, the volunteers, the players all came together for a great day! And Congratulations to Bert Wyman, winner of the Chelsea clock! A team comes off the 9th green, which featured the chance to win a new Subaru from Bath Subaru with a Hole-In-One. 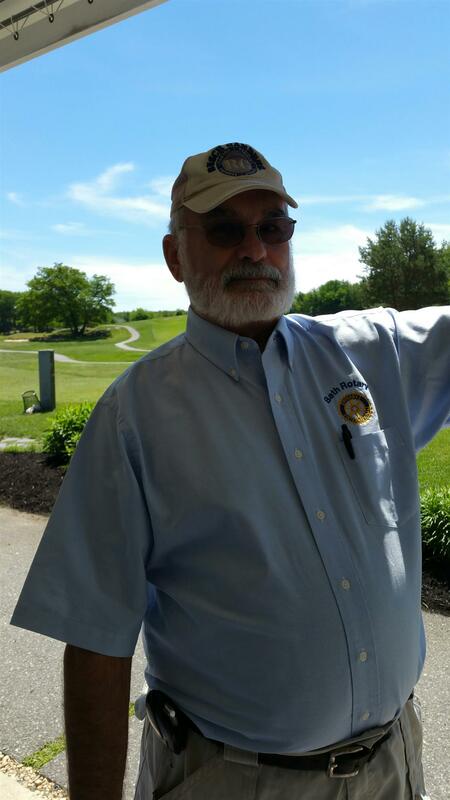 President Elect Jeff Labbe monitors the clubhouse during the 24th Annual Rotary Golf Classic. 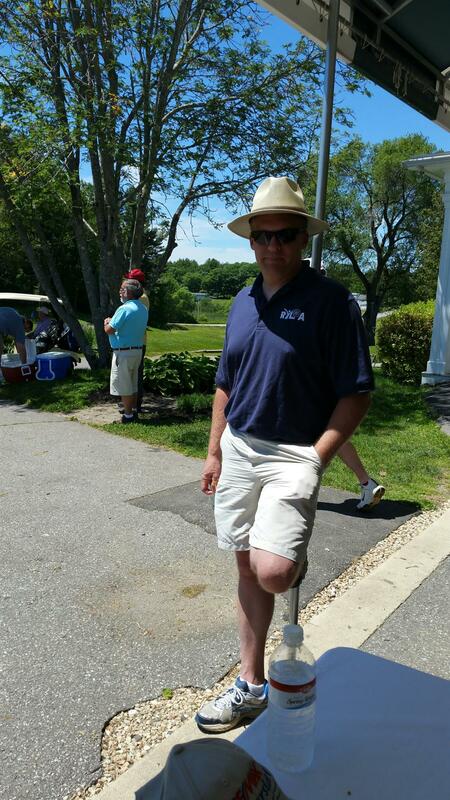 Bath Rotarian Guy Saucier helps with sage advice during the 2015 Rotary Golf Classic. Bath Rotarian Don Spann relaxes by the firepit behind the clubhouse. Rich Cromwell is back home in Maine and this is his final report from Cambodia. Our consultant, Kristen, and I met on Tuesday to conduct the final review of our “Knowledge, Attitude and Practices (KAP) Survey”. The insight that we have gained into water, sanitation and hygiene issues in these five villages is amazing and will guide us through developing a holistic, in depth action plan to address the villagers’ desperate situation. The data is so comprehensive that it will also act as a baseline and allow us, upon completion of the project, to measure our results accurately. We were able to reconcile the villager survey with our interviews with the five village chiefs, and blending the results of those separate surveys gave us a lot of confidence in both surveys’ results. 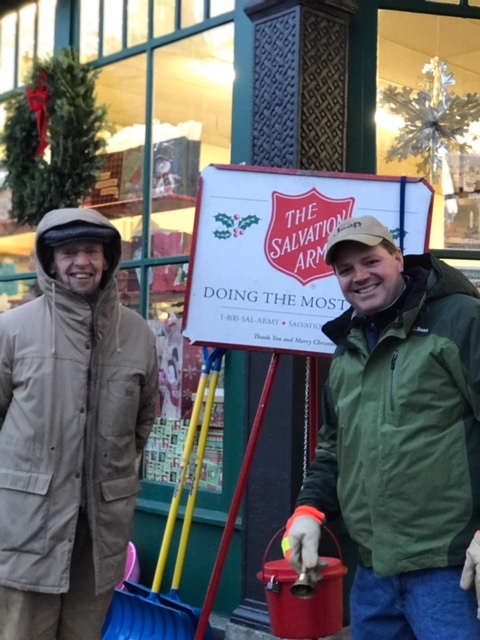 Bath noontime and Sunrise Rotarians rang the bells for the Salvation Army kettle drive at Renys and Shaw's today, braving snow showers and temps below freezing to embody the motto "Service Above Self". Below is another report from Rich Cromwell in Cambodia. The chief data and survey referred to is posted in the downloads section on the left hand side of our homepage. The report of my second week’s work will be a bit shorter. However, I have attached the questionnaire which we developed to interview the villagers and also the results of our Village Chief survey. It is Monday night the 17th of November here in Siem Reap Cambodia. My first week has been busy and in keeping with the schedule and goals established in our grant request. On Wednesday the 12th I met at "Water for Cambodia" (WFC) , our Rotary sponsored partner, with Nthabeleng, the Director, and Kristin, a consultant hired to develop our village survey and compile the data we produce. We spent a few hours reviewing our grant application and synching it with reporting documents that are commonly used in gathering decision making data that will be used in the context of a global grant. I devoted Thursday to the kids at the orphanage we supported last year. A glorious touching day spent with healthy, joyful children. Don Carrigan of WCSH 6 news interviews George Dole on the anniversary of the first sub-4 minute mile. 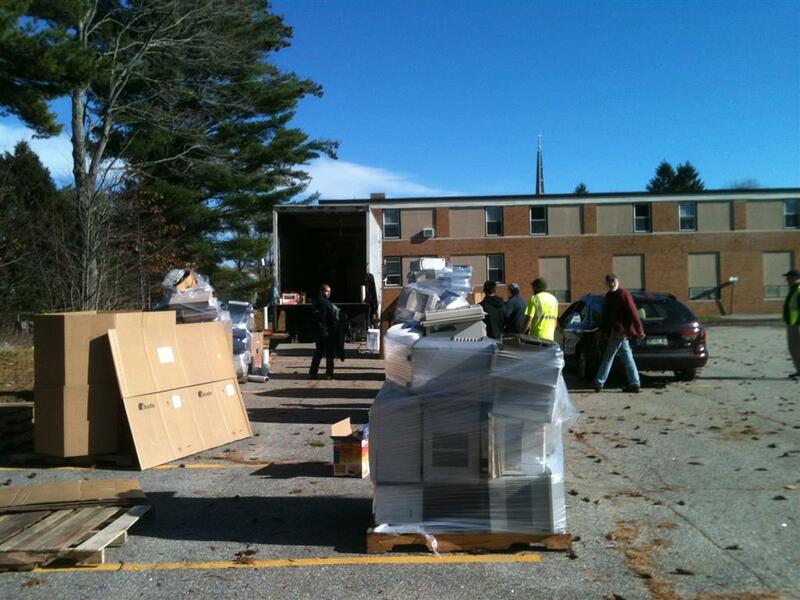 Thanks to all who donated and recycled their electronic waste at our collection event on November 8th. 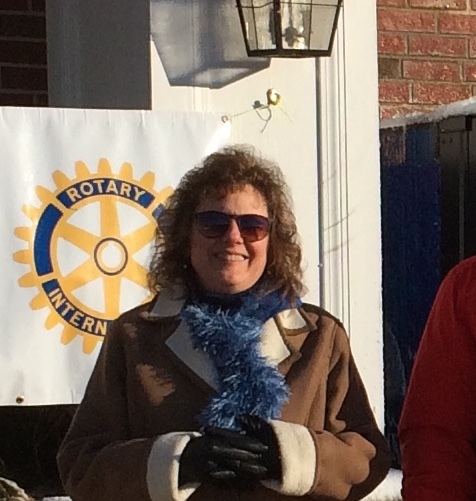 A big thank you also to Rotarians Jason Ritchie, Lee Patenaude, Kim Brackett, Michelle Nickles, Carolyn Lockwood, Tom Edwards, John Evans and Joel Austin for their assistance. A special thank you to the crew at North Coast Services for their patience and courtesy and to the Bath Recreation Department for the use of their parking lot. A little chill in the air and overcast skies didn't dampen the spirits of the 86 participants in the Bath Rotary 4-Way 5K held on October 11th. Congratulations to the overall winners Krystal Douglas of Harpswell with a first place time of 19:51 and second place finisher John Totman of Phippsburg with a time of 19:58. Thanks to all who participated and to all of the sponsors and volunteers who made the race such a success. President Lou Ensel's inducted 4 new members in ealy July: (l to r in photo) Barbara Whidden, Don Spann, Lesley Dollinger and Ed Rogers. President Will Neilson presents a check to Patten Free Library director Lesley Dolinger. 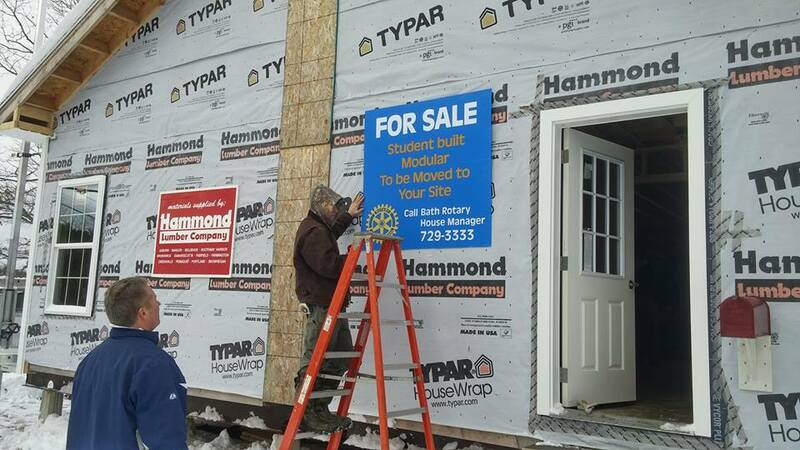 Fellow Rotarian John Sunderland and his wife are spearheading a fundraising effort to replace the furniture in the reading room. The furniture, purchased from Country Farm Furniture in Bath, should arrive sometime in July. Bath Rotarian Bob Warren is presented a Paul Harris award by Lee Patenaude accompanied by his wife, MJ Warren.